Some of the best illustrators in the country will be exhibiting at the Silpe Gallery this month as the culmination of their work in a one-of-a-kind MFA (Master of Fine Arts) program. The inaugural MFA in Illustration Thesis Exhibition will take place from July 9–20 in the Silpe Gallery, which is located in the Hartford Art School. 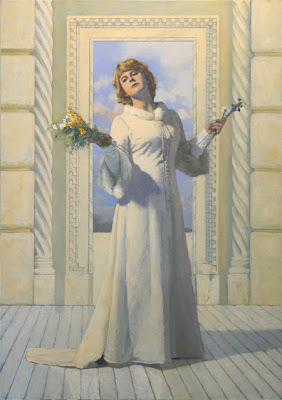 There will be an Artists’ Reception at the gallery on Friday, July 20, from 5 to 7 p.m.
Ken Smith's thesis project includes illustrations of famous actresses in classic theater roles. The illustration above is titled "Pray, Love, Remember" (Ellen Terry as Ophelia).